Rub salt and five spice powder all over the duck. Rinse and pat dry the duck with paper towel. Remove the quills and feathers on the skin if there are any. Prick the duck skin and the fat layer underneath using a knife or bamboo skewer. Be careful not to pierce the meat. 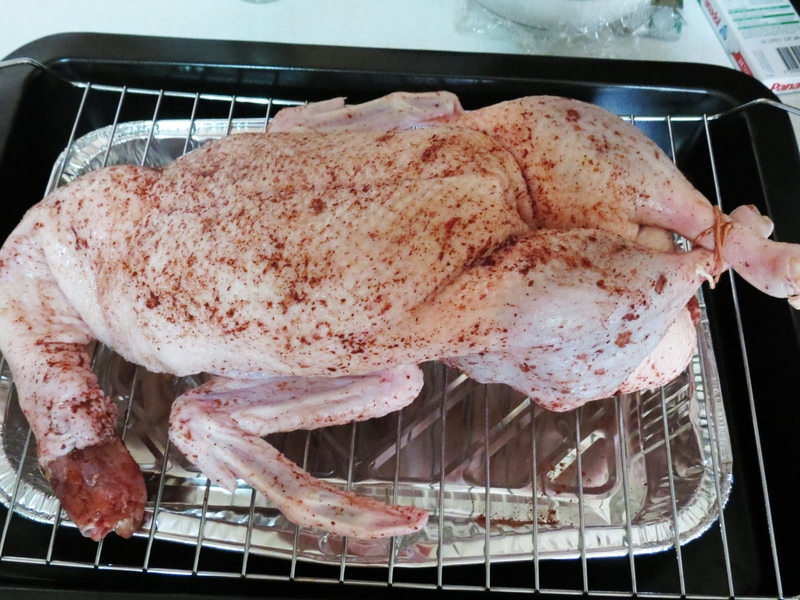 Rub salt and five spice powder all over the duck as well as the cavity of the duck. Stuff the cavity of the duck with garlic cloves. Using a kitchen twine, truss the duck. Put the duck (breast side up) onto a baking tray lined with aluminum tray to catch the duck drippings and pop the duck into the preheated oven and bake it for 1 hr. After an hr, bring out the duck and prick the skin all over to release the duck fat. Pay extra attention to the area around the legs as they are extremely fatty. Flip the bird over so that it is breast side down and wrap the wing tips with aluminum foil to prevent them from burning. Pop the duck back into the oven and bake it at 300 °F for 1 hr. After 1 hr, bring it out, prick the skin all over again, and flip the duck so that it is breast side up this time. Roast it in the oven for 1 hr at 300 °F. After 1 hr, bring it out, prick the bird, flip the bird and bake it breast side down for the final hour at 300 °F. Remove the duck from the oven after 1 hr. Increase the oven temperature to 400 °F. Remove the aluminum tray and pour out the duck fat and put it back into the baking tray. Put the duck breast side up on the baking tray and bake it for 10 min in the preheated oven. After 10 min, remove the duck from the oven. The skin should be golden brown and crispy. 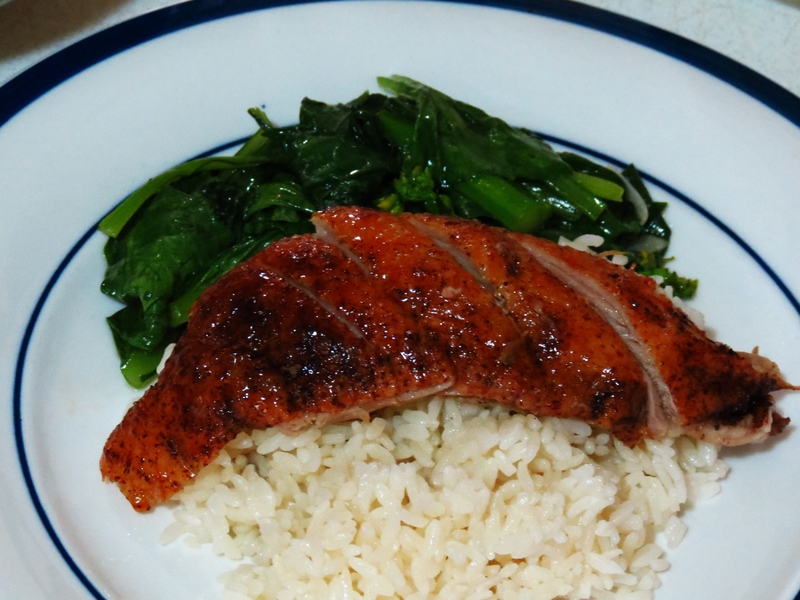 Soften the maltose in a microwave and brush the glaze all over the duck. Put the duck breast side up into the oven and roast it at 400 °F for another 7 min. After 7 min, bring it out from the oven and let it rest for at least 10 min. Remove the garlic pieces from the duck cavity. To make the dipping sauce for the duck, combine hoisin sauce, shaoxing wine and oyster sauce in a small bowl and mix well. 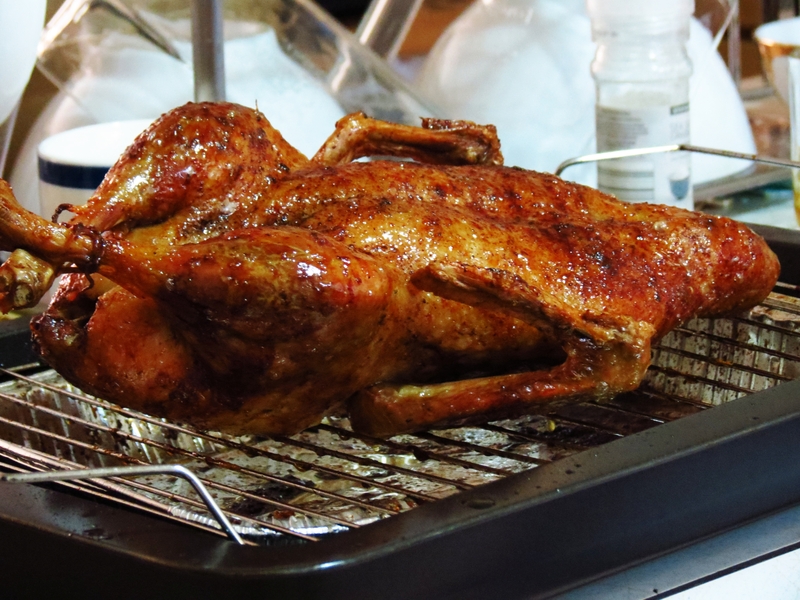 Carve the duck and serve it warm with rice and dipping sauce.